I am a McGregor from Bainsville and have been going through old deeds and documents left to me by passing relatives, etc. I've been trying to trace the McGregor's back to Scotland and while doing so, came across this site. I was looking at the info under Bainsville and wanted to let you know that Bainsville is located on Lot 16 (not 17), Concession 1. Lot 16 (300 acres) was first issued by Crown Deed in 1789 to Thomas Busby (originally of Ireland) for his military service. His son, Thomas Busby of Montreal, sold Lot 16 to William McBean (not McBain) on June 22, 1814, for 200 pounds. William McBean sold Lot 16 to his brother, John McBean, on April 25, 1845, for 300 pounds. That deed specifically refers to Lot 16 as Beanfield. On March 17, 1858, John McBean willed Lot 16 north of the Grand Trunk Railroad to his son Donald Duncan McBean. He willed Lot 16 south of the GTR to his son Lewis Carmicheal McBean. To his wife Isabella he willed their current dwelling on Lot 16 south of of the GTR (along with four cows and a horse), after which she was to pass it to Lewis. It appears that Lewis lived with his mother and never married. Interestingly enough, on his will, John McBean signed as John McBean of Bainfield. On June 4, 1863, Lewis McBean and Isabella McBean sold Lot 16 south of the GTR, comprised of approximately 150 acres, to William Newcomb of Montreal for $400.00. While the mortgage/deed is made out to Lewis Carmichael McBean and Isabella McBean, Lewis signs as Lewis C. McBain. His mother signed with an X. William Newcomb died within the year and they transferred his mortgage to his widow, Elizabeth Newcomb of Montreal. On January 31, 1868, Donald Duncan McBean (a gentleman) sold Lot 16, north of the GTR, comprised of 120 acres, none in lease, to Alexander Stickler (a gentleman) for $200.00. While the mortgage/deed is made out to Donald Duncan McBean, he signed as Donald Duncan McBain. It appears that Donald Duncan McBain's (born McBean) sale of Lot 16 north of the GTR to Alexander Stickler didn't work out. It also appears that he inherited Lot 16 south of the GTR from his brother Lewis Carmichael McBain (born McBean). On April 28, 1870, Donald Duncan McBain (born McBean), a yeoman of the Township of Lancaster, sells the whole of Lot 16 to John S. Fraser, a merchant of the Village of Lancaster, for $2450.00. This deed identifies Donald Duncan as McBain, not as McBean as on the previous deed. John S. Fraser took out a second mortgage on Lot 16 with Donald Duncan McBain for $340.00 on May 1, 1871. On April 24, 1873, Donald Duncan McBain (born McBean) was living in Chicago and was back in possession of the whole of Lot 16 (perhaps payment default by John S. Fraser). On April 24, 1873, he sold Lot 16 to Joseph Taylor McPherson of the Township of Lancaster. The deed again lists Donald Duncan as McBain, not McBean. Joseph McPherson paid Donald Duncan McBain 257 pounds and took out a mortgage for a further $4000.00 on the lot. On January 8, 1877, Joseph Taylor McPherson sells Lot 16, approximately 300 acres, to Alexander McMillan and wife Maria of Cornwall for $4800.00. On On October 2, 1879, Alexander McMillan, yeoman, and wife Maria of the Township of Charlottenburg sell Lot 16 to Andrew Cook, yeoman, and Donald Cook Senior, yeoman, of Quebec, for $5750.00. On April 1, 1885, Andrew Cook, Donald Cook Sr. and Donald Cook Jr. lease part of Lot 16 to Donald D. McCuaig for 999 years at a rate of $4.00 per year. Interestingly enough, on May 10, 1906, Duncan D. McCuaig (heir of Donald D. McCuaig) sells his father's lot to Josephus Larue for $1000.00 even though Duncan D. didn't have title to the land. That created a nightmare when my father's executor, Beryl Paget Dobbin (nee McGregor), was trying to sell Lot 16 after my father's death in 1973. On September 10, 1889, Cook et al sell part of Lot 16 to Julien Larue for $300.00. On June 10, 1896, Cook et al sell 1/4 acre of Lot 16 bounded by 9 Mile Road to Malcolm Condie (amount not listed on deed). On March 16, 1903, Agnes Condie sells the 1/4 acre to Telesphore Larue for $950.00. On August 28, 1908, Telesphore Larue sells the 1/4 acre to James A. Sangster (not MY Sangster family) and Duncan McCuaig for $375.00. They form a business called Sangster and McCuaig. On April 10, 1911, the heirs of Andrew Cook and Donald Cook Sr sell what is left of Lot 16 to Alexander J. McGregor and wife Mary Jane (not MY McGregor family) and Finlay W. McBean for $5000.00. 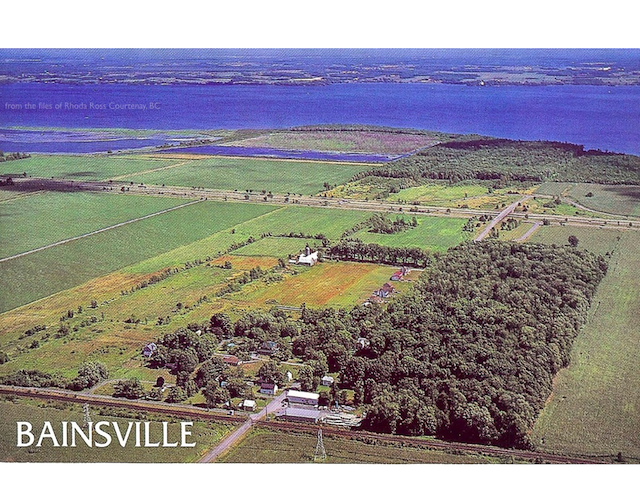 On June 28, 1913, the Alex J. McGregors and Finlay McBean begin selling lots within what is now Bainsville to: Catherine McCuaig ($300.00), Joseph Larue ($100.00), Duncan D. McCuaig ($75.00), Alexander McBain ($200.00), and Jane C. McBain ($200.00). On October 23, 1913, Finlay W. McBean and wife sell their half interest in Lot 16 to Alexander J. and Mary Jane McGregor. On June 15, 1914, Alexander J. and Mary Jane McGregor sell what is left of Lot 16 to Walter Gilbert Balaney, a farmer from Alfred in the County of Prescott, for $10,825.00. Between October 23, 1913, and June 15, 1914, the 3rd line road is put in to provide public access to what is now Bainsville. On March 1, 1915, Walter Gilbert Balaney sells Lot 16 to my paternal grandfather, Alexander Peter McGregor and his brother, William Fred McGregor, for $10,860.00. Starting July 9, 1915, Alex P. and W. Fred sell further lots in Bainsville to: Josephus Leroux ($190.00), William D. McPherson ($? ), Hattie McCuaig ($? ), Ellen McCuaig ($? ), Colin McPherson ($200.00), William N. McEwen ($160.00), Colin McPherson ($160.00), Bainsville Farmers Cooperative ($74.00), James Black ($? ), and William D. McPherson ($330.00). On May 27, 1925, William Fred McGregor sells his half share in Lot 16 to Alexander P. McGregor and his wife, Mary Watson (nee McLeod of the 7th Concession of Lancaster Township McLeods) for $5,500.00. On October 15, 1948, Alexander P. and wife sell part of Lot 16 to George Nicol ($200.00). On December 7, 1948, they sell a further part to George Nicol ($425.00). Lot 16 was further carved up by Cedar Rapid Man and Power Company (power lines October 13, 1913), Ruggles Wheeler Wood (March 1, 1915 and June 25, 1915, who then sold to Duncan D. McCuaig on June 28, 1915), Highway 2, Highway 401, and South Service Road. This it the point at which I have no further original deeds or documents. Alexander P. McGregor sold Lot 16 to my father, Keith McLeod McGregor and wife (my mother) Margaret Jean (nee Sangster of the 3rd Concession, Township of Charlottenburg Sangsters) in the 1960's. After my parents died in 1973, Lot 16 was sold. So Bainsville started as Beanfield, then became Bainfield. The McBeans started as McBean, then became McBain. One more wrench to throw in. In the "new part" of Bainsville, there is a street named MacGregor. The original McGregors on lot 16, Alexander J. and wife, were Mc, not Mac. My grandfather Alexander P. was a Mc, not Mac (his father in Cote St. George was Mc, and his grandfather in Loch Tay, Perthshire, was Mc). My father Keith was born and baptized a Mc but for some reason, he started signing his name Mac (scottish snobbery?). When my grandfather died, his headstone at St. Andrews Church in Bainsville was incorrectly inscribed with MacGregor. When my father died, his executor didn't want to confuse things so had his headstone inscribed with MacGregor as well. My sisters and I are all Mc and happy to be.